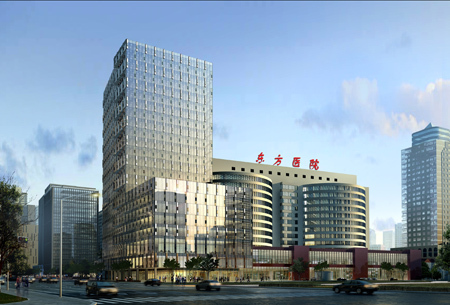 Located in the Lujiazui Finance and Trade Zone, Shanghai East Hospital dates back to 1920. Subordinated to Tongji University, it is a grade-three and class-one comprehensive hospital integrating medical services, training, research, emergency rescue, disease prevention, rehabilitation and health preservation functions. The hospital is divided into southern and northern divisions. It has 61 clinical and medico-technical departments and bed space for 2,000 patients. Its emergency department treats more than 3 million people each year, including 50,000 foreign visitors. It boasts a wide range of advanced medical equipment, including PET-CT scanner, 3.0T magnetic resonance imaging, and DSA and EDGE radio surgery systems. The hospital management has attached great importance to clinical teaching as well as teaching administration. In recent years, the hospital has been a clinical base for students from the Medical School of Suzhou University, Zhenjiang Medical School, Shanghai Second Medical University, and the Stomatological Hospital of Tongji University. It is authorized to offer master's degree programs in heart and chest surgery and in endocrinology for Shanghai Second Medical University. It has also provided clinical training for master's students from Shanghai Second Medical University since 2000. At present, the hospital has 2,800 staff, including over 400 specialists with senior professional titles.